‘The appeal of the reaction is that it breaks the rules,’ says Michael Hill from the University of Bath, UK, who made the discovery together with his PhD student Andrew Wilson and computational chemist Laurent Maron from Paul Sabatier University in Toulouse, France. 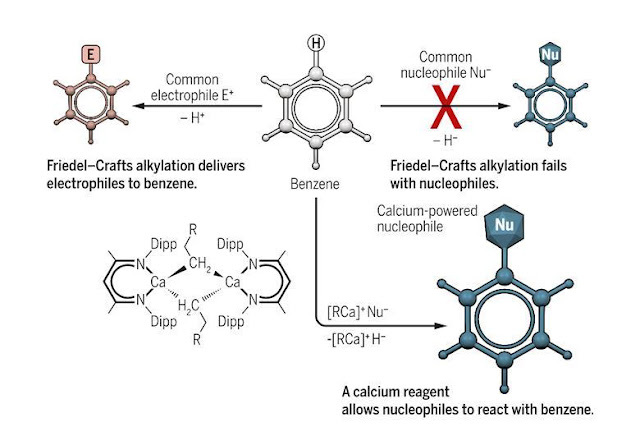 For chemists, the concept ‘like repels like’ means that electron-rich molecules like benzene can hardly be convinced to react with nucleophiles. To make alkyl-substituted benzenes, the Friedel–Crafts alkylation therefore uses an electrophile, with which the aromatic ring readily reacts. However, the 140-year-old reaction has two major shortcomings: it cannot attach linear alkanes to the aromatic ring and it tends to produce a mixture of compounds because the product of the first alkylation reacts further. Hill’s calcium-mediated nucleophilic alkylation overcomes these limitations. ‘[The calcium complex] sets benzene up for the nucleophilic attack and it also drags electron density away from that electron-rich aromatic ring,’ Hill explains. It then transfers its alkyl substituent to benzene and removes the superfluous hydrogen atom from the ring, producing a benzene with a linear alkane chains such as ethylbenzene. Discovering calcium’s rule-breaking behaviour was complete coincidence, says Hill. Wilson was investigating the reaction between calcium hydride and terminal alkenes to produce alkyl calcium complexes. But the reaction was slow. He decided to heat it to 60°C to speed it up. The reaction produced alkylbenzenes – an unexpected result. ‘We recognised was that we were forming the alkylated benzene from the reaction between the alkyl calcium and the reaction solvent, benzene,’ Hill explains. ‘The observation that this may be a nucleophilic attack was very provocative.’ Maron and his team analysed the reaction computationally, confirming Hill’s hunch. Although Hill admits that the reaction currently might be of limited use for organic synthesis – it requires a stoichiometric amount of the air-sensitive calcium complex – calcium might offer more surprises. ‘These compounds have a much wider reactivity than we reported so far,’ he tells Chemistry World.